Join us in Nepal, as we travel ‘home’ for the holidays to spend the Christmas holiday season in our home away from home with our Sherpa friends in Everest’s Khumbu region. We welcome you to bring your families along for a unique Christmas and New Year’s adventure, and we have carefully crafted our trekking schedule to correspond with school schedules so that you can bring your whole family. Anyone who has traveled to Nepal knows just how magical it is. Now you can share the magic with the children in your life and you can open their eyes to a way of life different from their own. We will encourage local children to join us on parts of the journey so that the children can learn about each other’s lives and cultures. 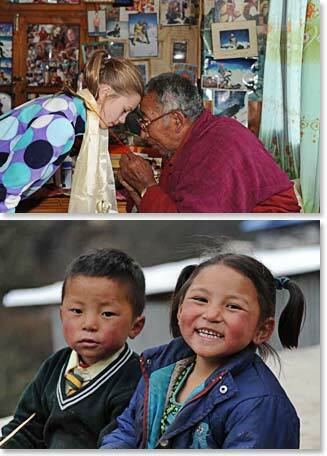 We will have opportunities to visit local schools, monasteries and a hospital which are great opportunities for children and adults like to see the differences and similarities between our own lives and the lives of the Sherpa people. 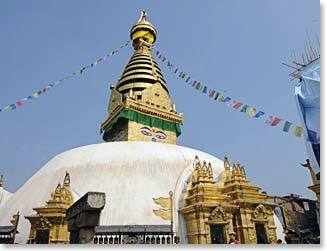 Beginning from our home base in Kathmandu, the five-star luxury of the famous Yak and Yeti hotel, we will immerse ourselves into the history, art and religion of one of the most fascinating cultures in the world. In Kathmandu, you will receive a Mountain Hardwear down jacket and down sleeping that you can use on your trek and can bring home with you at the end of your journey! A flight to the airstrip at Lukla, elevation 9,200ft/2,805m, is the beginning of your trip to the high world of Everest mountaineering. 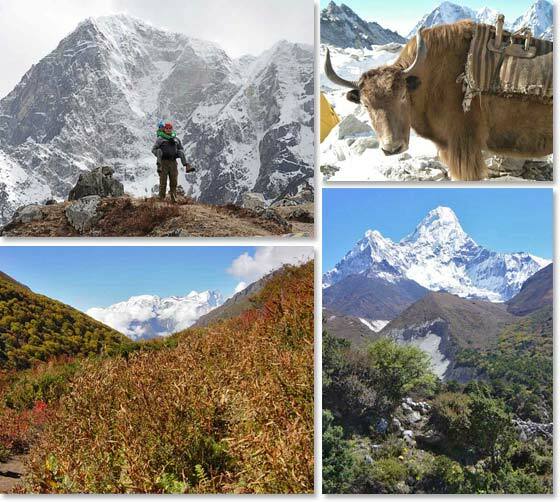 Your high point will be the scenic village of Pangboche, home to Berg Adventures Nepal Director of Operations Ang Temba Sherpa, with its stunning views of Everest and Ama Dablam. We will spend Christmas Day in at a comfortable and scenic lodge in Namche Baazar, the economic hub of the Khumbu region. On Christmas morning, everyone will have a present from Berg Adventures to open and we will start the day with a short walk to the viewpoint above our lodge. With any luck, we will get our first view of Mount Everest! After a hearty Christmas morning brunch, you and your families will have the day to explore the charming village of Namche where you can shop for souvenirs and gifts, eat a fresh cinnamon bun or visit the Sherpa museum. Because Christmas is not an official holiday in the Khumbu, stores will be open as usual. We will finish the day with a special Christmas dinner. New Year’s Eve falls on our last night in the Khumbu before we return to Kathmandu, so we will have a celebration with our Sherpa staff to thank them for their friendship and service over the course of our trek. We will spend New Year’s Day in Kathmandu at our 5-star hotel. The Everest region of Nepal is home to some of the greatest mountain walks on earth. The most spectacular mountain scenery in the world is before you each day of this trek. Besides Everest, you will become familiar with other Himalayan giants: Ama Dablam, Thamserku and Lobuche Peak to name a few. You will have a unique opportunity to absorb the ancient and colorful scenes of a Himalayan trading culture. This is truly a pilgrimage that any lover of the mountain world and mountain cultures will consider the opportunity of a lifetime. Our Khumbu treks are first rate from start to finish. For this holiday adventure, we will supply each person with a warm, Mountain Hardwear down sleeping bag and down jacket. We stay in the comfort of private rooms in the nicest of trekking lodges and bring along our own talented cooks and cook staff. We schedule plenty of rest days to aid in acclimatization and to provide the opportunities to explore and spend more time with our Sherpa friends. While your vision of December in the Everest region may be of a cold, snowy and hostile environment, this image could not be farther from the truth. Residents of the region and trekking experts alike believe it to be the nicest time of year to visit. Temperatures are cool, but comfortable and relatively mild. It is also the driest month of the year, so you can expect clear skies with very little precipitation. Dressing in layers will help you to cope with the moderate daytime and cool evening temperatures.